Above is the rear assembly, in pieces. The reversing lamp lens (left) is cracked, and the bulb holder is corroded. 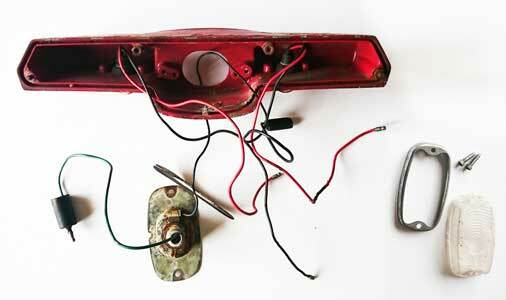 The bulb contacts for the two number plate lights are also corroded. As these parts are exclusive to the 1970 year GT6 Mk2 and Spitfire Mk3, the parts for these are not listed in the workshop manual or parts book, so some research is needed for replacements, as they must have come from existing British Leyland parts bins. 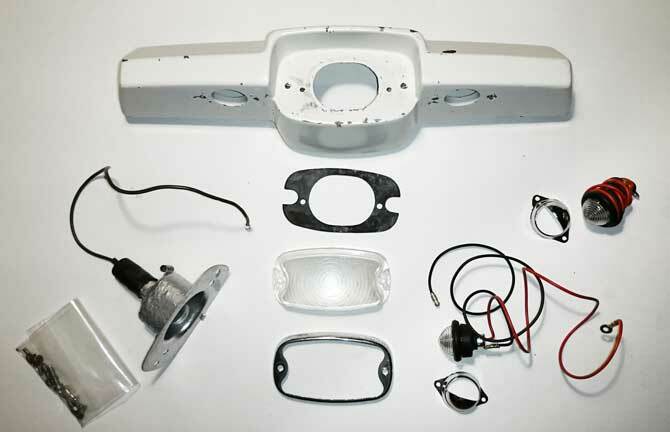 The reversing light is common with the Series 1 E Type Jaguar, and the lens/bulb holder assembly is available from Holden for £51.95 (L595/52549). I cleaned mine up and repainted it, obtaining replacement NOS Lucas L595 lenses from eBay for less than £10. The number plate lights are identical to Boot interior lamps (alternative) for all Stag models (142002). The chrome plated light bezels cleaned up nicely! Please see refurbished/replacement parts below.